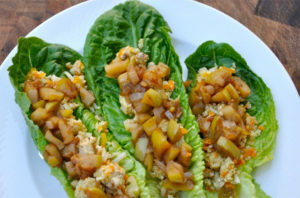 Dinners like these Turkey Lettuce Wraps will help you quickly reach your fat loss goal. The shredded cauliflower, rice and onions in this recipe make an amazing substitution for grain-based pilaf. With the addition of organic ground turkey and lettuce this comfort-food tasting meal is actually quite lean and green. Next StoryTalk About Some CORE POWER!